(Nanowerk News) A process that is too fast to be measured and analysed. Yet a group of international scientists did not lose heart and conceived a sort of highly sophisticated moviola film-editing system, which allowed them to observe - for the first time in a direct manner - an effect underlying high-temperature conductivity. The results of their work have been published in Nature Physics on Monday 9 March 2015 (doi: 10.1038/nphys3265). 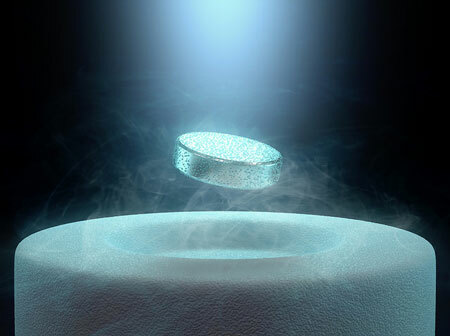 Superconductors have properties that make them potentially very interesting for technology (examples of application include magnetic levitation trains). The road to a true application of the extraordinary properties of these superconductors is, however, blocked by the fact that the "classic" ones work at extremely low temperatures close to absolute zero, and therefore impracticable. Copper oxide-based superconductors, thanks to a higher working temperature, are more promising but the possibility of synthesizing superconductors at ambient temperature remains a distant goal. The main barrier is the lack of understanding of the mechanism enabling copper oxides to turn into superconductors. One of the main problems is understanding whether the electron interactions inside the material are direct and instantaneous or mediated by some "delayed" interaction. To answer this question, we need to look at the process "in real life", but given its unusual rapidity, this is far from easy. "The solution we devised is based on the use of ultrafast light pulses, lasting 10 femtoseconds, that is, 10 million billionths of a second", explains Claudio Giannetti, of the Catholic University of the Sacred Heart, who coordinated the research. "To be able to carry out these measurements our laboratories developed a unique experimental apparatus capable of producing, utilizing and measuring light pulses of different colours that last less than 10 femtoseconds", adds Giulio Cerullo, head of the ultrafast spectroscopy laboratories of the Department of Physics of Milan Polytechnic. The method developed resembles that of "high-speed photography" invented by Eadweard Muybridge more than 100 years ago. "The famous stroboscopic images, or motion pictures, can give an idea of what we did", explains Massimo Capone, researcher at SISSA in Trieste, and among the authors of the paper. "Muybridge, a bit like us, would take photographs of fast-moving objects, breaking down their motion into many still frames before creating those beautiful images (that have become icons) that provide a reconstruction of the path of motion. We did something very similar, in a tiny temporal (and spatial) dimension, using infinitely short light pulses as obturators, to observe ultrafast changes in the properties of a superconductor". The scientists applied the technique to different families of high-temperature copper oxide superconductors, thereby succeeding in measuring what they define as the "fastest slow process" in a solid, and their findings support the hypothesis that electron interactions in these superconductors are mediated by the spin of electrons. "In general, electron interactions in a solid can be divided into direct interactions, which are virtually instantaneous, and "delayed" interactions, which occur when the electrons interact with other particles (bosons deriving from excitation of the ion network or from magnetic excitations)", explains Capone. "These latter processes are thought to be fundamental for superconductivity to occur, as they form the 'glue' that holds the electrons together in the so-called 'Cooper pairs' underlying the superconducting phenomenon itself". "To date, similar experiments carried out with a lower temporal resolution succeeded in accessing only the 'slow' processes related to electron interactions with the vibrations of the crystal network formed by ions (phonons)", explains Cerullo. "In this study, for the first time we measured electron pairing with another family of excitations linked to electron spin and magnetism". "This pairing", concludes Giannetti, "had so far been impossible to access with experimental analyses because it occurs in a timeframe of only 10 femtoseconds. Our technique and its original utilization have opened a new window on ultrafast processes in high-temperature superconductors".